This July 4th, there are many events across Miami for you and your family to be a part of. 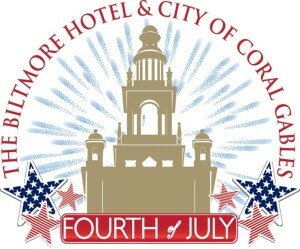 In Coral Gables, you can join the city in celebrating at the Biltmore Hotel. The celebration will include a special concert but the Greater Miami Symphonic Band, concessions, patriotic mascots, and a magnificent fireworks display. The City of Coral Gables is teaming up with the Biltmore Hotel, the University of Miami, Coral Gables Chamber of Commerce, and several corporate sponsors to bring you this free event. There will be refreshments available for purchase. More details are listed below. Friday, July 4th. Grounds open at 5 p.m., live concert at 7 p.m. and fireworks show at 9 p.m.
Fireworks (including sparklers), smoking, grills, pets, tents, glass containers and weapons are NOT permitted at the event.